Sri Narasimha Swamiji went to Maharastra, personally interviewed innumerable devotees of Sai Baba, and recorded their experiences in 1936. This is well known to all devotees of Sai Baba. In November 1937, he records his own experiences. In November 1937, he was at Thiruvannamalai and was intending to start for Madras by train. A friend, Sri Tulasidas P. Sahani offered to take him by car. The distance between Madras and Thiruvannamalai is 140 miles. It was raining at Thiruvannamalai. Hence he consulted Baba whether he should proceed by the car or by train. The answer was by train. But the friend urged Sri Narasimha Swamiji to change his mind, as the journey time would be passed by singing bhajans and Namavali. The rule with Sai Baba was and is, is that once a decision is given a second consultation on the same matter is not to be sought “Say Rama Dhwirnabhibhashate”. Sri Narasimha Swamiji however pleaded with Baba to permit him to transgress his orders once, as the object of the transgression was pious. He also prayed that the penality for the transgression be lenient. Then they all started by car. There was rain throughout. The group was cheerful, singing bhajans and Namavalis. After the fifth mile, suddenly they heard a sound of snapping and the car shuddered to halt. Sri Tulasidas who was driving the car alighted and found that the rear axle was broken. At the place of the break down, there was no shelter and it was raining. Of course getting the car repaired was out of question in that desolate place. In the mean time, what were they to do? Sri Narasimha Swamiji then revealed to his friends that he had joined them against the express of Sai Baba. He submitted himself to Sri Sai Baba, thanked Baba for the lightness of the penalty and prayed for further direction. They waited for 45 minutes inside the car in the pouring rain. A car coming from Thiruvannamali drew up along side. Sri.P.Krishnamachari, salesman of Volkart Brothers, Madras, was at the wheel, the sole occupant of the car. HE offered to take them to Madras. As soon as they got into Sri Krishnamachari’s car, he told them that events since that morning were puzzling him. Earlier, in the day, he had written to his home at Madras, that his people need not expect him back for another four days, as he had decided to extend his stay at Thiruvannamalai. But at 11 a.m. something made him suddenly change his mind, and he wished to start for Madras. He could not discern any clear reason for this change of mind. He went to Sri Ramana Maharshi at whose Ashram, he had been staying, for permission to leave. The permission was readily granted and he at once started for Madras. He met the group stranded on the road. He said that his change of decision, and the urgency he felt to get back to Madras now ceased to be a riddle when he met the group stranded on the road in the helpless condition. Sri Narasimha Swamiji told Sri Krishnamachari, that Sai Baba interceded on his behalf. Sri S. Subba Rao, was a pleader at Gooty. His daughter was suffering from neurasthenia from the month of December 1939. She has lost memory, could not focus attention, was afraid of everything that she saw and observed. Fear was dominant in her. She was unsteady and passed sleepless nights. In April 1940 she was taken to Shirdi. There Abdul, Baba’s attendant, gave her udhi and thritham. From then onwards, she began to have sound sleep. She began to make namajapa of Baba, recovery set in, and she became hale and hearty. One Bhaskar Sadashiv Satam, joined the Maharashtra Police Force. On 16/2/1940, due to some misfortune, he was suspended. He was dismissed from service on 28/2/1940. Even as early as 1930, his friend Atmaram has suggested that he should go to Shirdi to have darshan of Sai Baba, but Sri Satam had put off his visit. Soon after he was dismissed, Satam went with his son to Shirdi, stayed there for two days and prayed before Baba. On his return to Bombay he met a constable who told him that he is reinstated and posted to Lamington Road Police Station. Satam knew that on such order no such order could have been passed on the date he met the constable because on 28/4/1940 he appealed against the dismissal order. On 14/5/1940 the appeal was heard and the order passed was “Reinstated Posted to Lamington Road Police Station”. Baba had given the verdict two months earlier through the constable. In 1940, R. Nagappa, a copyist in District Court, Ananthapur, was fined Rs.1.00 by the criminal court, which according to him was unjust. He vowed to Sai Baba, that he would pay Him Rs2.00 if the fine was cancelled. Nagappa went up in appeal. The appeal court cancelled the fined. He gave Rs.2.00 for Sai Pooja. In 1940, Baba told Sri Ramanaiah of Gudur, in his dream that he should build His temple on the site which lay north to his house. But the site did not belong to Ramanaiah but to another person, a labourer by name Pichivadu. Ramanaiah was a devotee of Baba, but the other person had not heard of Baba. Soon after Ramanaiah’s dream Pichivadu saw in the jungle a fakir, who told him to hand over his site to Ramanaiah for the construction of Baba temple. The direction was repeated a second time. Pichivadu confronted Sri Ramanaiah with these facts, and when asked how the fakir looked like, he showed him Baba’s picture in Ramanaiah’s house. Pichivadu soon after gifted his plot of lad to Ramanaiah. Baba told Ramanaiah in his dream the dimension and specifications of the temple to be built. When people came to know about these happenings, some people gave bricks for the walls, some for the foundations and terrace, some provided with rafters, some provided wood for doors etc. Pichivadu also contributed with labour. With the help of the people a small temple of the size of 100 feet X 8 feet was built in less than four week’s time. Dr M K Rajagopalachari of Nellore contributed a Baba Portrait. Sri Narashima Swamiji, Sri Panini Rao and others attended the temple opening ceremony. This is how Sai Baba’s first temple in South India came to be built. In 1940, Sri Jayaram Naidu’s son, (sri Jayaram Naidu was superintendent of Corporation of Madras), five years old was seriously down with some ailment. On the day of the incident he had bought Baba’s photo to their house and he with his wife had prayed for the recovery of their son. In the night his wife was roused by someone patting her on the back, and telling her “this is not the time to sleep, look after your son”. She got up and found her son’s condition had deteriorated. His temperature was getting chill. Immediately stimulant and medicine were administered, and the boy began to recover. Upagrashta Sangamesan met and old Sage in 1941 who told him that Baba is a divine begin, who would never let down His Devotees, that he should do Nitya Pooja to Baba. He gave him a Baba photo. The sge also told him that in the beginning he has to face mental worries, official problems, domestic worries etc, and not minding these difficulties, if he continues his devotion, Baba will take complete responsibility for his welfare, material and spiritual. Sri Sangamesan began to perform Nitya Pooja and as predicted by the sage, his troubles came from all sides and became unbearable. At this point of time, he even began to lose faith in the Sage’s words and in Sai Baba and in desperation sat on the steps leading to Kapaleeshwar temple at Mylapore, Madras. He saw opposite to the temple a sign board, All India Sai Samaj. He went in and met Sri Narasimha Swamiji, Sangamesan bared himself before the Swamiji all his predicaments, doubts and misgivings. Swamiji replied as follows. ”No difficulties will come by having faith in Sai Baba and doing pooja to him. One cannot escape the debts of Poorva Karma. Belief in Baba and pooja to Him will help in liquidating the sins committed in Poorva Janma in course of time. You have so much dirt in your mind and on your soul. Hence the difficulties, that you are facing. When a seed is sown you cannot expect its fruits immediately. You have to wait patiently. It may take a short time or it may take some years. You should not cut the tree which is in the process of giving fruits. When the tree starts giving fruits, not only you, everybody in the locality will benefit.” Sangamesan continued his Nitya Pooja to Baba and also met Swamiji several times there after. From 1965, Sai Baba began to speak to Sangamesan. Hundreds of people began to come to Sangamesan for solving their problems, He says that Baba’s powers are too many and his miracles can be known only by experience. Nagamma, a daily wage earner, was undergoing intense poverty. She was attending Sai pooja every Thursday at Sri Subba Rao’s house at Gooty, Andhra Pradesh, She Prayed intensely for an employment for her son so that she can get relief from the pangs of poverty. One night a fakir appeared in her dream and gave her some rupees and insisted that she take them. Within a week of this dream, her son got employment. Sri S.Jambunathan, Head Clerk D.F.O. Madura, was devoted to Sai Baba since 1940. Baba gave him forewarnings in dreams. He appeared mostly as an old man in dreams. Sri Jambunathan has a daughter. In 1942, Baba appeared in his daughter’s dream and told her “soon you will have a son”. 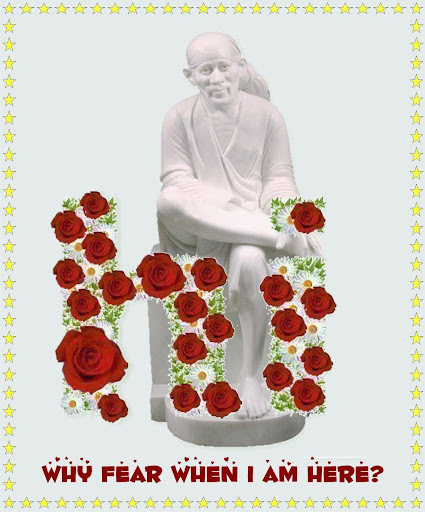 Accordingly a son was born who was named Sai Raman. Fourteen months after, she bore another son who was named Sai Prasad. In October 1943 four months after the birth of Sai Prasad, the “old man” appeared in his daughter’s dream and asked “will you give me Sai Raman”. The daughter resented. After two months, the old man appeared in her dream again and asked again for Sai Raman. She again refused. But the old man said, he would take away the boy at 4:15 AM on 5/1/1944. Sai Raman was a precocious and devout child who would always stand before Baba’s photo and would go to sleep lulled by Sai Keerthanas. Sai Raman began to have enlargement of liver and spleen, which became worse and worse in spite of the best medical treatment. On the fatal night, Sai pooja was performed and the mother watched all night by the child’s bed side. Just before the time fixed by Baba, the mother fell asleep, the clock in the room stopped and the lamp kept burning before Baba’s photo got extinguished. The mother saw Baba taking away the child in her dream. When she woke up with a start, the child was dead. Mrs. Mani Sahukar, in her book Sai Baba, the Saint of Shirdi, records these experiences: Dr Rustomji was a homeopath engaged in medical work in the homeopathic dispensary of Shirdi. It appears that the doctor owed Rs.300 to a person in Bombay. The doctor came down to Bombay, made a cheque for that amount and delivered it to that person. On returning to Shirdi he found, to his dismay, in his pass book, that he did not have that much amount to his credit in his account. The thought that his cheque would be dishonoured and what that person would think of him, as a consequence upset him very much. With implicit faith in his guru, Dr Rustomji pleaded with Baba to get him out of the predicament. His prayer was answered in a strange manner. A couple of days later, a casual acquaintance of his called upon him and asked the doctor if he would keep the small packet with him and that he would claim it back after three months. Dr Rustomji asked what the packet contained. “it contains Rs 300 was the amazing reply!” “Do you mind if I use the money”? asked the doctor. “I do not mind what you do with the money as long as the money is returned to me after three months” was the reply. The doctor thought that this was a god sent money, thanked the gentleman and immediately rushed to his bank and credited the amount to his account. He found to his great relief that his cheque had not been presented for payment. His honour was saved. Three months passed and Dr Rustomji’s benefactor did not turn up. His address was not known. After six months, Dr Rustomji suddenly saw his benefactor walking down the road. The doctor went up to him greeted him and asked him why he did not reclaim his money, that he has been waiting for him to return the money, but the man, looked blank and replied that he had not given any money to the doctor. Thinking that the man was joking, the doctor pressed the notes into the gentleman’s hand. But the gentleman refused, denying vehemently that he had given any money to the doctor. It soon dawned upon the doctor, that the fakir, who had lived in Shirdi, many many years ago, had played his leela on His devotee. Smt. Mani Sahukar, was going through a difficult period of her life and was feeling unhappy and frustrated. A neighbour of hers brought Sri Narasimha Swamiji to her house in Bombay in the year 1942. Sri Narasimha Swamiji at once sensed that all was not well with her. He seemed ot have come to meet her and help her. Taking her aside he said, “don’t worry, why don’t you seek refuge in Sai Baba”? SMt. Mani Sahukar, was not particularly religious, and knew nothing about saints, much less about Sai Baba. “Who is Sai Baba”? She asked. As a reply the Swamiji put in her hand a packet of books written by him and blessing her asked her to read them. He added that “there is a lovely picture of Baba in this packet for you.” She says that though she was touched by the kindness of the Swamiji, his advice and gift made no immediate impression on her. She put away the packet without opening it and persisted in her misery. Her husband became an instrument to draw her to the spiritual path. He opened the packet and after reading one of Swamiji’s books, and seeing Baba’s radiant picture, he said, “Sai Baba seems to be a great saint, why don’t you read these books” They might help you.” But Smt. Mani Sahukar remained unmoved. After a few days however, she began to feel penitent, and more to please her husband, she took out Baba’s picture from the packet framed it and put it on the table in front of their beds. This simple and penitent gesture started the miracle of her conversion. The very next day in the afternoon as she lay sleeping on her bed in front of the picture of Baba, she was blessed with a lovely visitation. As she was dozing, in her sleep she suddenly saw Baba’s photo lit up a translucent glow. His face broke into a tender smile. His hand came out of the frame, as it were and He beckoned her to his forefinger. She dreamt that she jumped out of the bed and rushed towards Baba’s photo. Sai Baba then placed His hand on her head in a blessing. She woke up with a start, when she actually felt the ecstasy of Baba’s touch. She was thrilled. She claims that this was her initiation and remembers Baba’s sayings “I seek out my bhakthas and draw them to me.” She says that from that hour her life changed. Her old apathy was gone and she came closer to Sai Baba. About the year 1950, Smt. Mani Sahukar started suffering from a peculiar ailment of throat, a severe irritation and congestion which prevented her from indulging in her cherished hobby of singing Hindustani classical music. In about 10 minutes of singing, her voice would become hoarse, and she would put down her tambura with a feeling of frustration. She consulted many doctors, both allopathic and homeopathic, but none gave her any relief. After six months of this predicament, she went to Shirdi. As she stood before Sai Baba’s Samadhi, her heart and eyes suddenly welled up with tears and in an impassioned outburst she poured out her feelings. She came out of the Samadhi Mandir and visited her friend who was at that time staying in the Samsthan premises. In her pleasant company, she almost forgot her miseries and went to her room at 7:30 p.m. Her room was just behind Gurusthan. She opened the lock and entered the room and thinking that she would be more comfortable; she removed the pin which fastened her sari to her left shoulder. As she was doing this, she heard something rustling in the folds of her saree. As small packet two inches long fell from her saree. She was perplexed and wondered how the packet came about. She picked it up. It was neatly folded as if by a chemist or compounder. She unfolded it and saw it contained 6 to 7 white tiny tablets, such as are used in homeopathy medicine. When she realised the significance of this, she draped her saree again and rushed to her friend. Her friend who was a great devotee of Baba, herself had several experiences; she said “you understand, don’t you. That this is Baba’s Prasad”? Mrs. Mani Sahukar put the tablets in her mouth. When she returned home, she found that she could sing without hindrance and her problem had disappeared. Her heart overflowed with gratitude. About a year later Smt. Mani Sahukar had another remarkable experience. She was to go to Poona for some work. She had her seat reserved in the cubicle train called Deccan Queen. She sat near the window seat and as there was still half an hour for the train to start, she began sipping tea looking outside her window. She suffered from a curious lapse of memory in recognising faces. She may be introduced to a person, and meet him several times but the face does not register itself in her memory. Due to this, she was misunderstood on several occasions, which made her miserable and sensitive. A well dressed man passed by her window several times, looking at her with interest. She now felt that his was another instance of an acquaintance whom she had met and forgotten. She therefore smiled at him as if in recognition, and wishe him. At this, the man became friendly and joined her in the compartment. The train had hardly proceeded some distance, when the man began to show his true colours. He even bolted the compartment from inside. Mrs Sahukar, courageously got up and unbolted the door. She did not leave the compartment because her suitcase contained some valuable articles. She sat down again, and concentrated on Sai Baba and prayed to Him to rescue her from the predicament. As she uttered this prayer mentally, and turned her gaze towards the door, a porter was standing, looking quizzically at her. How the porter appeared just at that moment, in a running train, she had not time to think. She grabbed the opportunity, told the porter to remove her luggage to the open compartment; she cast a glance at the miscreant, and saw a look of utter surprise in his face. After she gathered herself in her new seat, she bean to understand with a shock, that the porter might not be an ordinary porter. She went up and down the corridor of the train, to meet porter again and thank him, but he was nowhere to be found. She got down at Poona, thrilled and chastened. An elderly lady by name Kamala Ammal of Matunga, Bombay, was in Shirdi for the Punyathithi of Baba in 1943. Her son was in war service. She was in great agony and sought Baba’s help. She was occupying a room next to the Samadhi. At 8 p.m. in the dark, she moved on, not knowing that the steps behind the Samadhi had no parapet wall, (at that time) she fell down on the stone surface. Her knees forehead was bleeding. When offered medical help she declined, stating that when she fell, a male with a lit lantern stood by her side and gently passed his hands over the hurt portion of the body. When she looked up it was Sai Baba Himself. He told her she would be all right and that He would look after the welfare of her son. In 1913, a blind man was found singing before Baba at Shirdi, to the tune of cymbals. His favourite song was “Jai Jai Ramakrishna Hari” a traditional bhajan. Swami Sai Sharan Anand, found the same man in Shirdi in 1942-43, reading and reciting chapters of Bhagawat Geeta, and Gnaneshwar’s amruthanubhava. Queried how he was able to see now when he was blind in 1913, he said that Baba had improved his eye sight even then, so as to see with blurred vision. After Mahasamadhi, his eye sight became clear, and with His grace, he is now able to write, read and move about. Page created in 0.524 seconds with 69 queries.